It started out as just another beach clean-up. Earlier, we visited the national monument and surrounding park that mark the northernmost tip of Borneo. It’s a gorgeous spot, with rolling hills that drop off onto a shore of massive rocks and white sand. Sadly, the beach bordering the park was littered with water bottles, plastic bags, random flotsam, and a boatload of flip flops (you'd be amazed by the sheer number orphaned flip flops on the beaches here). The place needed to be cleaned up, and bad. Armed with two large garbage bags and a double layer of sunscreen, we hit the beach. We started at the tip of the park, working our way down the shoreline away from the monument. 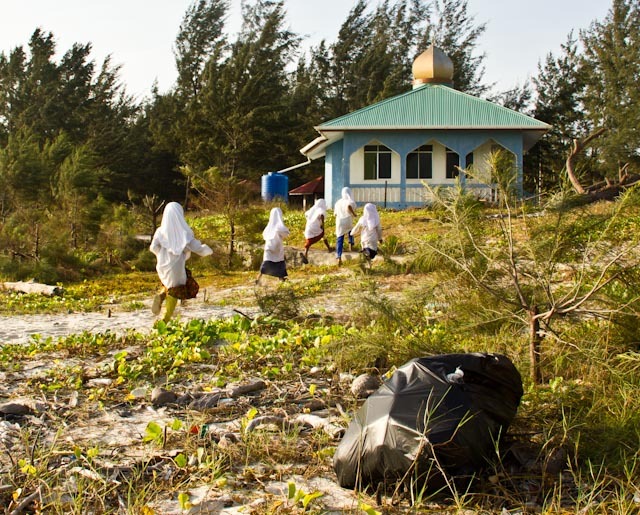 We filled bag after bag, dumping their contents into the nearby trash cans of a tree-lined rest area, next door to what looked like a mosque overlooking the beach. The sun was hot, and the trash seemed to go for miles. Sweating, we cleaned our way toward the mosque. And that’s when it happened. From the beach we saw a woman in a hijab exit the side of the building, pointing toward us and speaking loudly in Malay. Was she talking about us? Were we trespassing on holy ground of some sort? We looked at each other and then back toward the mosque. Suddenly, from behind the woman sprang five little girls covered from head to toe in white. They ran straight for us. Some wore sandals, a few only wore socks. Five expressionless faces showed from beneath their veils. Standing alone on the beach, our bags half full of plastic bottles and flip flops, we could do little more than wait to see how this one turned out. Neither of us moved. The little girls stepped out onto the sand just a few feet from us. Then, without looking our way, they each began filling their arms with plastic bottles. Wait, what was going on? We looked at each other again, then back at the girls. Their arms were quickly filling up, as they hugged bottles and bags and old flip flops. 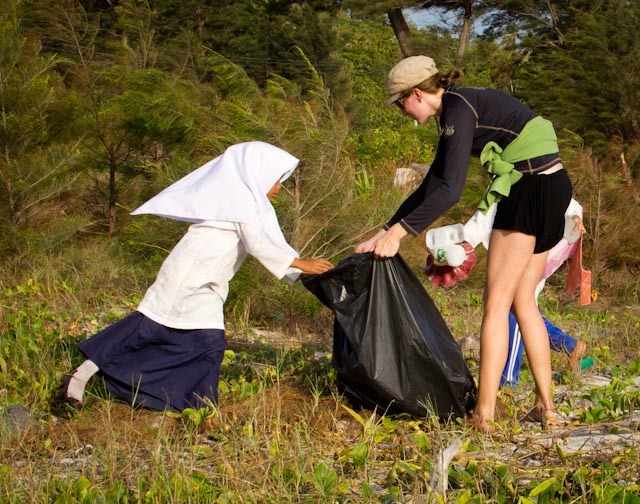 Following their cue, we approached them slowly, opening our garbage bags for them to deposit their collections. At first, they were hesitant to make eye contact or to get too close. But after an approving nod from the older woman, they dropped what they carried into our garbage bags, and ran to collect more bottles, giggling all the way. The addition of a few more helpers made us work more quickly. We couldn’t dump the bags fast enough, so we had to work out a relay system to be sure there was space for all the trash the girls were bringing from every direction. We filled (and properly disposed of) more than 10 large garbage bags in less than an hour. The seven of us worked our way further and further from the mosque, until the older woman gave a shout that must have signaled it was time for the girls to head home. 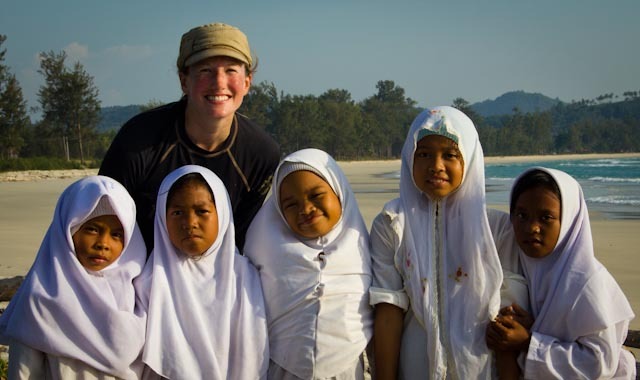 As our little helpers bounded across the sand toward the mosque, all we could do was wave and shout, “terima kasih,” the only words we knew in Malay. The girls giggled “sama sama” (you’re welcome) as they ran like five little angels, back through the mosque door, leaving us alone on the empty beach.